Not just number plates, insurance, road tax and licensing. Especially the idiots that belong to cycling clubs who think they own the roads (they don't) and ride 5, 6 or more abreast down the road. EDIT - it is now a link because I quoted it. I've found that when links don't link they do after a go back to edit but I don't ever need to do anything just go in to edit and save back out. Your link isn't a link 🤷‍♀️ no big deal - just saying. I want a date with a supermodel and a Ducati motorcycle! 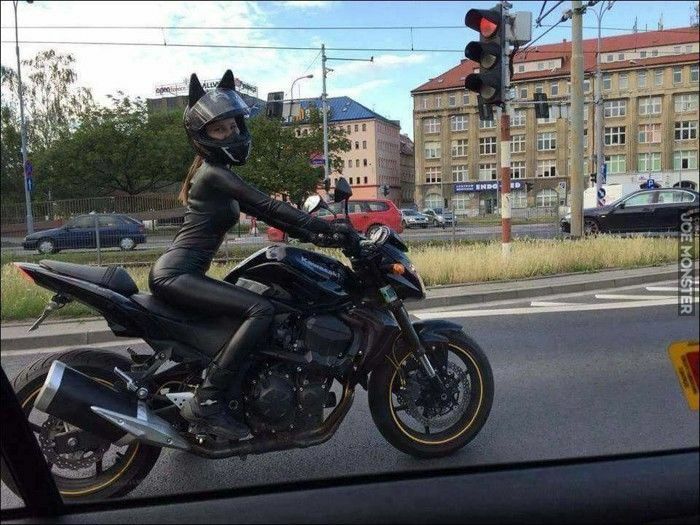 I was too busy looking at the girl to notice it is a Kawasaki. Not a Ducati - but a Kawa-cati. Having been the victim of a cyclist who scraped down the side of my car whilst I was stationary and who then just rode off, leaving me with a £500 bill, I can only agree. Unfortunately if the cycl;ist did have insurance you would never have know so it wouldn't have made any difference! Having said that I do agree that cyclists should be insured, I am a cyclist and I do have third party insurance. Fortunately I have never had to make a claim. I suppose the sort of cyclist that takes out voluntary insurance is probably not the soirt of cyclist that is likely to cause trouble! I think there are both well behaved and rotters on both sides of this divide and for every bad cyclist experience someone somewhere will have a bad driver story; but like you say the difference is that is that cars have registration plates and assuming you manage to record it or take it down correctly you have a way of tracing the driver unlike a cyclist. The vast majority of cyclist on the road are well behaved and law abiding, they're the ones you don't notice or immediately forget about, but the population is growing (and Brexit, if it ever happens, is not going to stop that) and our roads aren't so things can only get worse. I don't feel any great need to see cyclists registered but I also don't see any harm in it either. I do, however, think insurance is fair; anybody owning a horse who is a member of the British Horse Society gets third party insurance as part of their membership I see no reason why cyclists can't do something similar. But without a form of visual identification how do you bring a claim against them. I suspect that cyclists (who are soft and squashy) probably feel victimised and intimidated by drivers (who are neither soft or squashy) and therefore feel justified in their bad behaviour; They are not but when you create a situation of them and us nobody behaves particularly well. Unfortunately if the cyclist did have insurance you would never have know so it wouldn't have made any difference! Having said that I do agree that cyclists should be insured, I am a cyclist and I do have third party insurance. Fortunately I have never had to make a claim. I suppose the sort of cyclist that takes out voluntary insurance is probably not the soirt of cyclist that is likely to cause trouble! err ...... he would have had licence plates. That is the whole point. At the moment the rogues are no better than anonymous thugs with their adrenalin boosted up by riding on the limit, in the wrong place, while ignoring the traffic signs and lights. At the moment the rogues are no better than thugs with their adrenalin boosted up by riding on the limit, in the wrong place, while ignoring the traffic signs and lights. Except they can be identified from their registration plates unless on very rare occasions they have cloned them. Surely the aversge well behaved cyclist has nothing to fear from compulsory insurance and identifiable registration. However if I remember correctly if the registered keeper doesn't declare the driver it is assumed to be them. At least I think that was the situation with speeding. I have 6 bikes am i supposed to pay for tax insurance and "mot next" for all of them? Why not? If I had six cars I would be expected to, and just like you and your bikes, I could only use one at a time. Be aware that an increasing number of cyclists have head cameras. They can record your reg. no., but your dash cam can't identify them. ............... or are you just getting high on polemic? * yeah, I know, 3 lefts do make a right. Yup, fine, we'll pay the same rate as electric cars shall we? You could always SORN some of them. Having read the linked article, the peer was concerned about being unable to identify a woman who attacked him, who happened to be on a bike. The logical follow-on from this must be that all pedestrians should have to wear a mode of identification (jacket with post code and home address perhaps) in case you see a pedestrian committing an offence (littering, dog fouling,assault). I'm not a cyclist myself, I have the motorised version. This is a polarised debate but I side with the cyclists. Pay road tax? what, while a so called 'eco' car doesn't pay anything? I suspect a lot of the angst from car drivers is born out of jealousy. Either from the fact that a cyclist can get to the front of the queue at traffic lights, ahead of car drivers who are paying a couple of hundred pounds a month for the leased cars that they will never own. That, or jealous that they would have a heart attack themselves, if they even considered moderate exercise.